The quality of storage really matters for all aspects of business continuity – primary storage, secondary storage, and backup. Especially backup. When all else fails, if the backup fails, hope is lost. The business grinds to a halt. The days of considering data protection a “nuisance chore” that simply needs the “cheapest” storage are gone. It’s simply not enough to run weekly or nightly backups on whatever storage is lying around and hope your IT team can “put Humpty Dumpty back together again” quickly, with any level of confidence. Data protection and business continuity are primary considerations in defining the quality of information systems and the businesses they support. With new data creation expanding the primary storage footprint exponentially, data protection is struggling to keep up economically and technically. To address these challenges, many companies have already made a shift, utilizing higher performance, purpose-built solutions for backup. They’re leveraging deduplication to keep up with the rate of data growth, working hard to stay within the backup window and meet an acceptable time frame for data recovery. But it isn’t enough. Many solutions are lacking in availability, failing at the crucial moment when a restore is needed. Some are lacking in performance, unable to meet backup windows. Even worse, still more systems are overwhelmingly expensive to buy, operate, and maintain. When it comes to business continuance and data protection, the quality of the storage matters. Enter INFINIDAT’s solution for business continuance, InfiniGuard. Building off of the successful introduction of the InfiniBox® five years ago which disrupted the market for large-scale, high-performance enterprise storage, INFINIDAT has turned its attention to the solving enterprise’s pressing data protection problems. The decision was fairly easy to make, given an overwhelming demand from our current customers who were looking for a cost-effective alternative to the 800-pound gorilla in the market, and their [incredible] experience with the InfiniBox for primary and secondary storage deployments. While some customers were already leveraging the InfiniBox in backup-to-disk deployments, the opportunity to amplify the capacity using deduplication AND enhance the reliability of restore functionality was the direction to go. While many systems do a reasonable job ingesting data, few, if any, do an admirable job restoring data – the critical element to any business continuance or disaster recovery plan. An essential design element of the InfiniGuard is delivering consistent, highly reliable, restore performance. To understand more about the underpinnings of the InfiniGuard, and some of the benefits (lower power consumption, high availability, ease of use, ease of integration, etc.) be sure to read the INFINIDAT Architecture White Paper as well as the specifications for the InfiniBox which serves as the foundational technology. 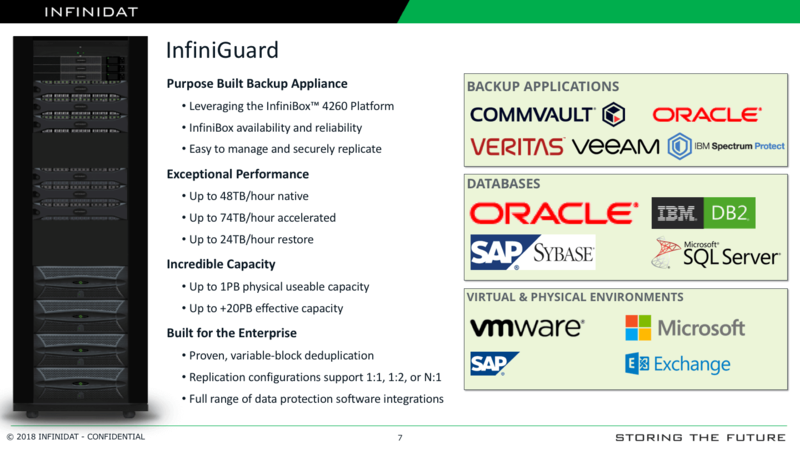 InfiniGuard is a business continuance solution that has seamlessly integrated the technology of the enterprise-proven InfiniBox with an industry-hardened deduplication technology. The result is a backup solution capable of storing upwards of 20 PB of data with exceptional performance for backup AND restore while meeting the requirements for integration, availability, and usability. ALL of this is done at a price well below the industry leader. Sounds interesting, right? We’re very aware that backup software dictates the choice of a backup solution. InfiniGuard is already certified compatible with many of the most popular backup applications in the market: Veritas Netbackup and Backup Exec, Commvault (Simpanna), IBM Spectrum Protect (TSM), Veeam, and Oracle RMAN, with additional certifications on the horizon. Did we mention the core technology storing the data is faster than all-flash primary storage and designed to provide seven nines availability? When was the last time a backup system was built with high availability and high reliability? Not until now. From the lightning fast drive rebuilds (<15 minutes), to predictive analysis for system and component integrity, to constant data integrity analysis, the InfiniGuard eliminates risk where it should never exist – your business continuance architecture. InfiniGuard, like the InfiniBox, drives cost out of IT infrastructure. We provide all these features, across multiple protocols, with three years of support and an account Technical Advisor. There are no extra costs for additional features or protocol support. Unbelievable? Let us prove it. To learn more about InfiniGuard, head over to the InfiniGuard landing page or let us know you’d like to talk with someone. Joe Roa is a Corporate Storage Solution Architect and NAS specialist for INFINIDAT. He has worked in IT for over 30 years and spent the past 20+ years with a focus on Unix systems, Storage Administration and Data Management Solutions. He has represented major brand solutions as a technical expert at IBM, Veritas, and Sun Microsystems. Joe’s spent a significant amount of his career in the field as a Systems and Storage Administrator for large Corporations, Universities, and Healthcare providers.